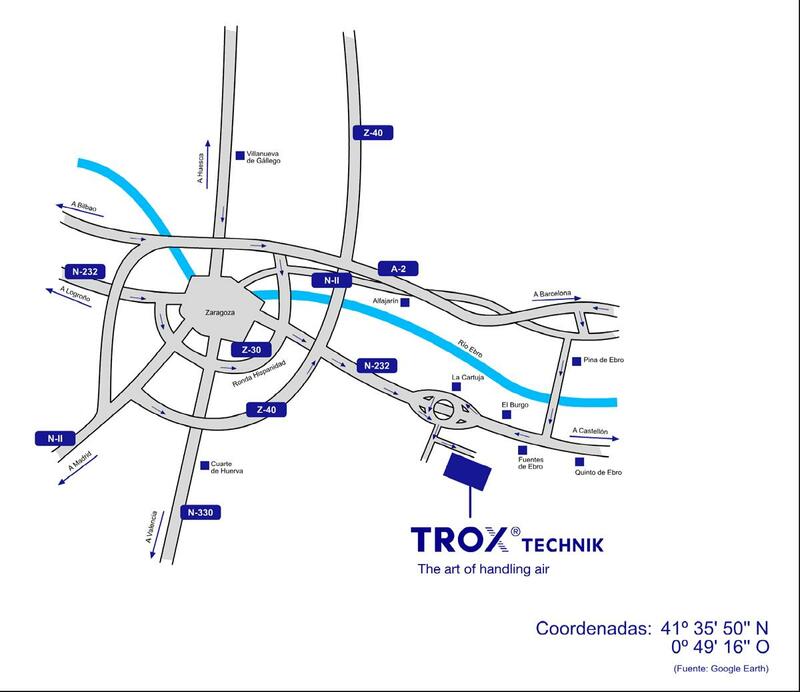 POLÍTICA DE PRIVACIDAD | TROX España, S.A.
We would like to thank you for your interest in our company. The protection of your data is of primary importance to our management team. It is, in principle, possible to use the TROX GROUP websites without providing any personal data. However, if a data subject wishes to make use of particular services provided by our company by means of our website, it may be necessary to process personal data. Where it is necessary to process personal data and there is no legal basis for such processing, we will generally obtain the consent of the data subject. The TROX GROUP, as controller, has put in place a number of technical and organisational measures in order to ensure that the personal data processed via this website are provided with end-to-end protection as far as this is possible. Nevertheless, transmission of data via the Internet can exhibit fundamental security gaps, for which reason it is not possible to guarantee absolute protection. Data subjects are therefore also welcome to communicate personal data to us using alternative means, for example by telephone. 'Personal data' means any information relating to an identified or identifiable natural person (referred to as the 'data subject'). A natural person is considered to be identifiable if they can be identified, directly or indirectly, in particular by reference to an identifier such as a name, an identification number, location data, an online identifier or to one or more factors specific to the physical, physiological, genetic, mental, economic, cultural or social identity of that natural person. 'Data subject' means any identified or identifiable natural person whose personal data are being processed by the controller. 'Processing' means any operation or set of operations which is performed on personal data or sets of personal data, whether or not by automated means, such as collection, recording, organisation, structuring, storage, adaptation or alteration, retrieval, consultation, use, disclosure by transmission, dissemination or otherwise making available, alignment or combination, restriction, erasure or destruction. 'Profiling' means any form of automated processing of personal data consisting of the use of those personal data to evaluate certain personal aspects relating to a natural person, in particular to analyse or predict aspects concerning that natural person's performance at work, economic situation, health, personal preferences, interests, reliability, behaviour, location or movements. 'Controller' means the natural or legal person, public authority, agency or other body which, alone or jointly with others, determines the purposes and means of the processing of personal data. Where the purposes and means of such processing are determined by Union or Member State law, the controller or the specific criteria for its nomination may be provided for by Union or Member State law. 'Recipient' means a natural or legal person, public authority, agency or other body to which personal data are disclosed, regardless of whether they are a third party or not. However, public authorities which may receive personal data in the framework of a particular inquiry in accordance with Union or Member State law shall not be regarded as recipients. 'Third party' means a natural or legal person, public authority, agency or body other than the data subject, controller, processor and persons who, under the direct authority of the controller or processor, are authorised to process the personal data. 'Consent' means any freely given, specific, informed and unambiguous indication of the data subject's wishes by which he or she, by a statement or by some other a clear affirmative action, signifies agreement to the processing of personal data relating to him or her. Every time the TROX GROUP website is retrieved by a data subject or automated system, the website records a set of general data and information. These general data and information are stored in the server log file. The following information can be recorded: (1) the browser types and versions used; (2) the operating system used by the accessing system; (3) the website from which an accessing system arrived at our website (known as the 'referrer'); (4) the web pages visited on our website by an accessing system; (5) the date and time of access to the website; (6) an Internet Protocol address (IP address); (7) the Internet service provider of the accessing system; and (8) other similar data and information that can be used to protect against threats in the event of attacks on our IT systems. These general data and information are not used by the TROX GROUP to arrive at any conclusions regarding the data subject. Rather, this information is used (1) to deliver the contents of our website correctly; (2) to optimise the contents of our website and our advertising of it; (3) to ensure the continuous functional capacity of our IT systems and the technology for our website; and (4) to provide the prosecuting authorities with the information necessary for prosecution in the event of a cyberattack. These anonymously collected data and information are therefore evaluated statistically by the TROX GROUP, firstly, and are further evaluated with the aim of improving data protection and data security within our company so as ultimately to ensure the best level of protection for the personal data processed by us. The anonymous data from the server log files are stored separately from all personal data provided by a data subject. The data subject has the option of registering on the website of the controller by providing personal data. Which personal data are transmitted to the controller during that process is determined by the form which is used for registration. The personal data input by the data subject are collected and stored solely for internal use by the controller for its own purposes. The controller may arrange for transfer of the personal data to one or more processors, for example a provider of parcel services, who will likewise use the personal data solely for the internal purposes of the controller. By registering on the website of the controller, the IP address assigned by the data subject's Internet service provider (ISP), the date and the time of registration will furthermore be stored. These data are stored in consideration of the fact that this is the only way to prevent misuse of our services; if necessary, these data also make it possible to resolve copyright infringements and crimes that have been committed. It is therefore necessary to store these data as a safeguard for the controller. These data will never be transferred to third parties unless there is a legal obligation to do so or such transfer is for purposes of prosecution. The registration of the data subject, with voluntary provision of personal data, allows the controller to offer the data subject contents or services which, owing to their nature, can only be offered to registered users. In addition, registration of the data subject can be used to monitor use of the copyrighted text published by us, to check links and author credits, and for our own documentation purposes. Registered individuals are free to have the personal data provided at registration erased completely from the controller's database. The controller processes and stores personal data relating to the data subject only for the period required to achieve the purpose of said storage or to the extent that this has been envisaged by the European regulatory authorities or another legislator under laws or regulations to which the controller is subject. If the storage purpose no longer applies, or a storage period specified by the European regulatory authorities or another appropriate legislator expires, the personal data are blocked or erased as a routine matter in accordance with the legal provisions. The data subject has the right, granted by the European regulatory authorities, to request confirmation from the controller as to whether personal data concerning him or her are being processed. If a data subject wishes to make use of this right of access, he or she can contact our Data Protection Officer or any of the controller's employees at any time. The data subject furthermore has a right to information as to whether personal data have been transferred to a third country or an international organisation. Where this is the case, the data subject additionally has the right to obtain information as to the suitable safeguards relating to said transfer. If a data subject wishes to make use of this right to information, he or she can contact our Data Protection Officer or any of the controller's employees at any time. Any individual who is subject to the processing of personal data has the right, granted by the European regulatory authorities, to request the rectification, without undue delay, of incorrect personal data concerning him or her. The data subject furthermore has the right, taking into account the purposes of the processing, to request that incomplete personal data are completed, including by means of providing a supplementary statement. If a data subject wishes to make use of this right to rectification, he or she can contact our Data Protection Officer or any of the controller's employees at any time. Where one of the above grounds applies and a data subject wishes to arrange for erasure of personal data stored by the TROX GROUP, he or she can contact our Data Protection Officer or any of the controller's employees at any time. The Data Protection Officer of the TROX GROUP or another employee will arrange for the erasure request to be executed without undue delay. Where the TROX GROUP has made the personal data public and our company, as controller, is obliged pursuant to Article 17(1) of the GDPR to erase the personal data, the TROX GROUP, taking account of available technology and the cost of implementation, shall take reasonable steps, including technical measures, to inform other controllers which are processing the personal data that the data subject has requested the erasure by such controllers of any links to, or copies or replications of, those personal data, provided the processing is not required. The Data Protection Officer of the TROX GROUP or another employee will arrange for the necessary action in individual cases. The data subject has objected to processing pursuant to Article 21(1) of the GDPR and it is not yet verified whether the legitimate grounds of the controller override those of the data subject. Where one of the above requirements applies and a data subject wishes to request restriction of personal data stored by the TROX GROUP, he or she can contact our Data Protection Officer or any of the controller's employees at any time. The Data Protection Officer of the TROX GROUP will arrange for the restriction of processing. Any individual who is subject to the processing of personal data has the right, granted by the European regulatory authorities, to receive the personal data concerning him or her, which the data subject has provided to a controller, in a structured, commonly used and machine-readable format. He or she furthermore has the right to transmit those data to another controller without hindrance from the controller to which the personal data have been provided, where the processing is based on consent pursuant to point (a) of Article 6(1) of the GDPR or point (a) of Article 9(2) of the GDPR or on a contract pursuant to point (b) of Article 6(1) of the GDPR and the processing is carried out by automated means, provided that the processing is not necessary for the performance of a task carried out in the public interest or in the exercise of official authority vested in the controller. The data subject can contact the Data Protection Officer appointed by the TROX GROUP or another employee at any time to assert the right to data portability. Any individual who is subject to the processing of personal data has the right, granted by the European regulatory authorities, to object at any time, on grounds relating to his or her particular situation, to processing of personal data concerning him or her which is based on points (e) or (f) of Article 6(1) of the GDPR. This also applies to profiling based on those provisions. In the event of such objection, the TROX GROUP will no longer process the personal data unless we can demonstrate compelling legitimate grounds for the processing which override the interests, rights and freedoms of the data subject or the processing serves for the establishment, exercise or defence of legal claims. Where the TROX GROUP processes personal data for direct marketing purposes, the data subject has the right to object at any time to processing of personal data for the purposes of this kind of marketing. This also includes profiling to the extent that it is related to such direct marketing. Where the data subject objects to the TROX GROUP carrying out processing for direct marketing purposes, the TROX GROUP will no longer process the personal data for such purposes. Where personal data are processed by the TROX GROUP for scientific or historical research purposes or statistical purposes pursuant to Article 89(1) of the GDPR, the data subject, on grounds relating to his or her particular situation, additionally has the right to object to processing of personal data concerning him or her, unless the processing is necessary for the performance of a task carried out for reasons of public interest. The data subject can contact the Data Protection Officer of the TROX GROUP or another employee directly to exercise the right to object. In the context of the use of information society services, and notwithstanding Directive 2002/58/EC, the data subject is furthermore entitled to exercise his or her right to object by automated means using technical specifications. Any individual who is subject to the processing of personal data has the right, granted by the European regulatory authorities, not to be subject to a decision based solely on automated processing, including profiling, which produces legal effects concerning him or her or similarly significantly affects him or her unless the decision (1) is necessary for entering into, or performance of, a contract between the data subject and the controller, or (2) is authorised by Union or Member State law to which the controller is subject and which law also lays down suitable measures to safeguard the data subject's rights and freedoms and legitimate interests, or (3) is based on the data subject's explicit consent. If the decision (1) is necessary for entering into, or performance of, a contract between the data subject and the controller, or (2) is based on the data subject's explicit consent, the TROX GROUP will take suitable measures to safeguard the data subject's rights and freedoms and legitimate interests, which includes at least the right to obtain human intervention on the part of the controller, to express his or her point of view and to contest the decision. If the data subject wishes to assert rights relating to automated decision-making, he or she can contact our Data Protection Officer or any of the controller's employees at any time. Any individual who is subject to the processing of personal data has the right, granted by the European regulatory authorities, to withdraw consent to the processing of personal data at any time. If the data subject wishes to assert his or her right to withdraw consent, he or she can contact our Data Protection Officer or any of the controller's employees at any time. The controller collects and processes personal data from applicants for the purposes of the application procedure. This processing can also take place using electronic means. This is especially the case where an applicant transmits corresponding application documents to the controller via electronic means, such as by email. If the controller enters into an employment contract with an applicant, the transmitted data are stored, in compliance with the legal provisions, for the purposes of the employment relationship. If the controller does not enter into an employment contract with the applicant, the application documents are automatically erased six months after notification of the rejection decision, provided such erasure does not contravene any other legitimate interests of the controller. In this context, 'other legitimate interests' means, for example, providing a burden of proof in a process under the German General Act on Equal Treatment (Allgemeines Gleichbehandlungsgesetz, AGG). The controller has integrated Google Analytics (with anonymisation function) into this website. Google Analytics is a web analytics service. 'Web analytics' is the collection, compilation and evaluation of data relating to the behaviour of visitors to websites. A web analytics service records data including the website from which a data subject arrived at a given website (known as the 'referrer'), which web pages on the website were accessed, or how often and for how long a web page was viewed. Web analytics is predominantly used for website optimisation and for cost-benefit analysis of online advertising. The controller uses the extension “_gat._anonymizeIp" for web analytics using Google Analytics. This extension truncates and anonymises the IP address of the data subject's Internet connection if access to our websites originates from a Member State of the European Union or another country which is a party to the Agreement on the European Economic Area. The purpose of Google Analytics is to analyse the flow of visitors to our website. Google uses the data and information obtained for purposes including to evaluate use of our website, to create online reports for us which illustrate activities on our websites, and to provide other services relating to the use of our website. Google Analytics sets a cookie on the data subject's IT systems. Cookies have been defined above. Setting the cookie makes it possible for Google to analyse the use of our website. Every time a web page of this website is retrieved that is operated by the controller and into which Google Analytics is integrated, the web browser on the data subject's IT system is automatically prompted by the Google Analytics component to transmit data to Google for the purposes of online analytics. During that technical process, Google acquires personal data, such as the data subject's IP address, which make it possible for Google to trace the origin of the visitor and his or her clicks and, consequently, calculate commission. The controller has integrated Google AdWords into this website. Google AdWords is an online advertising service that makes it possible for advertisers to place adverts both in Google search engine results and in the Google ad network. Google AdWords enables advertisers to define keywords in advance which are then used to display an advert in the Google search engine results only if the user uses the search engine to retrieve a search result that is relevant to the keyword. In the Google ad network, the adverts are allocated to websites covering relevant topics by means of an automated algorithm and observing the predefined keywords. If a data subject arrives at our website via a Google advert, Google places a 'conversion cookie' on the data subject's IT system. Cookies have been defined above. A conversion cookie becomes invalid after thirty days, and is not used to identify the data subject. Provided it has not expired, the conversion cookie is used to track whether certain webpages, such as the basket of an online shopping system, have been retrieved on our website. Both we and Google can use the conversion cookie to track whether a data subject who has arrived at our website via an AdWords advert has generated a sale, i.e. has completed or cancelled a purchase. The data and information collected through the use of the conversion cookie are used by Google to create visitor statistics for our website. These visitor statistics are in turn used by us to determine the total number of users transferred to us via AdWords adverts, i.e. to determine the success or otherwise of the respective AdWords advert and to optimise our AdWords adverts for the future. Neither our company nor other advertising customers of Google AdWords receive information from Google by means of which the data subject could be identified. Several pages of the TROX GROUP website have social media plug-ins from Facebook, Twitter, LinkedIn, Xing, Google+ and YouTube as well as links to these social networks. The social media plug-ins and links can be identified via their respective network icons. When calling up a social media network via a plug-in or link, a direct connection is created with the server of the social media provider. Facebook, Instagram, LinkedIn, Xing, Google+ and YouTube record the respective Internet page from which their services were accessed. If a user of the TROX website is registered with one of these providers and is logged on at this time, the call-up of the Internet site can be associated with his/her user account. The social media providers Facebook, Instagram, LinkedIn, Xing, Google+ and YouTube do not provide any information about which specific information is recorded during the use of their plug-ins. TROX therefore has no information on the content, scope or the use of the data acquired by Facebook, Instagram LinkedIn, Google+ and YouTube Further information on this can be found in the data protection policy of the social media providers. Users who do not want to authorise the collection by a social media provider of personal data on the Internet pages of the TROX Group can deactivate the plug-ins in their browser. To prevent a connection being created to an existing user account, users must log out before visiting the TROX website.